I recollect the threat of lurking violence when I visited the village as a child through the Seventies. My grandmother protected this city kid by dictat to sundry country cousins; she knew the village community had a lot not going for it. Despite her attempts at censorship, whispers reached us – one uncle and his brothers had gone at another branch of the family with lathi’s over property, ‘faujdari’ took place, and much blood and skulls were spilt. Another uncle lost an eye when he was waylaid and shot at while on route to the village from the highway, a 6-kilometer distance on a deserted dirt road. And then there were a legion of stories of distant cousins from neighboring villages who took to the path of dacoity as a way of life. The state law and order machinery was absent, and the rough and ready justice of the villagers was what worked. Villages where you kept your doors open at night, where women walked free, and there were no thefts or violence might have existed in prehistoric Ram Rajya but not in the real villages of northern India. Violence was omnipresent, the response by the strong was swift and right was might. Usually, it was the oppressed and weak – women, low castes – got it the worst. In retrospect, however, the Seventies were simpler times – village society was slow and ‘backward’; agriculture was the unquestioned & a respected occupation; youth unemployment did not seem quite so immense; and everyone expected the rule of the law to improve as we developed. How wrong we were. 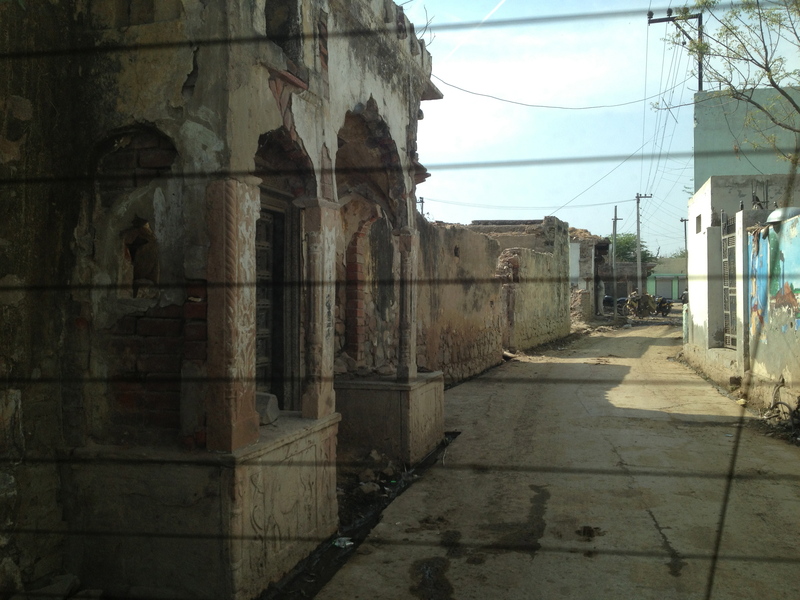 Violence is accepted as part of life in village Mangar, Faridabad (the periphery of which Aman Bagh is located), and is far far worse off than I recollect of my ancestral village in Bulandshahr, UP. The majority Gujjar community here had very little agricultural land and most lived off their cattle (located in a valley, till recently much of it was a lake, with land just about enough for subsistence farming) and till a decade back had no tarred road to connect them to the outside world. Over the past 5 years, Mangar’s picture perfect valley surrounded by the Aravali range and proximity to the urban centers of Gurgaon and Faridabad have brought city people like me to their village, the price of land has shot through the heavens and has violated their rudimentary rhythm of life. The restless, corrupting influence of land commerce has intruded, land has become the (only) currency, and the Gujjar has lost his balance. He needed to be educated, and slowly eased into the new world – he was pushed into the punishing sunlight way before he was ready. Witness the recent horrific attack by the Mangar Bani temple ‘baba’ and his many young village goons on Vijay Dhasmana, his wife and other bird watchers on 30 March 2014. http://timesofindia.indiatimes.com/city/delhi/Birders-attacked-at-Mangar-forest/articleshow/32991430.cms This self styled ‘baba’ is in no way a ‘holy’ man; he drinks, dopes and keeps a watch on the Mangar Bani for his sponsors in the land mafia (he is related by marriage to a former Mangar Sarpanch). To him, and many like him, city folk are cowards and easy prey, they come to the bani for fornicating and drinking, all city women are fair game, so beat these f***ers hard so the cars they have and the money they have and the life they live is revenged. The villagers have lived with the violence of this ‘baba’ for decades, and everyone overlooks his ways; he is one of them. Mangar smolders with a new violence – one generated out of unmet expectations, and youth with literacy but no real education. The mobile and internet revolution has brought the world of aspirations to them while new tarred roads and motorcycles took them to the world. Poor education has left them intellectually crippled and unemployable, ever more frustrated and dangerous to society. They want a lot, but have few means to achieve it; other than land deals which has a downward spiral of its own – the youth get partly educated so that working on the land in not good enough for them, and they are not good enough for the jobs the nearby city has. Both the desperate wanting and the inability to acquire what they desire are an integral part of the lives of the youth of Mangar – and of rural Haryana, and nearby UP. It’s a time bomb whose fuse is shortening, and we cannot ignore it because these youth live next to us no matter how high we raise the walls of our condominiums. http://www.downtoearth.org.in/content/desperately-seeking-skills-jobs. “500 millions jobs needed in the next 9 years, 12 million people entering the labor force each year, 30% graduates are unemployable” Who will create these jobs? Who will train these youth? Who will educate them? Read the April 1-15 cover story of Down To Earth, and lets do something about it. The many Twenty something youth loitering around the village during the day, with tight shorts, low waist jeans, insolent eyes and unshaven faces, are the first sign that everything is not well in my rural paradise. At times, they stroll away ever so slowly from the path of my Jeep to let it pass. At times, they glower with the frustration of the uneducated and unemployed. At night, you do not slow down at the groups of gossiping youth – you speed by. The village theka does brisk business, and I am told all (all) the men in the village are drunk every night. Alcohol and violence, how can they be separated? That is the claim to fame of all villages in this area in Haryana. After all, alcohol revenue pays the politicians and bureaucrats. And who are are the role models for, and leaders of, the villagers in Mangar, especially from within the dominant Gujjar community? The land wheeler dealers with the white suits, white shoes and white Scorpio’s with a political party’s (any party) flag; and their lack of values are what the young Gujjar boys aspire to – selling land works, makes them money today. Wealth at all costs, breaking rules. All is not lost, but we must have a deep sense of urgency to contribute. I have worked to open opportunities for some who want to escape the vortex of this new violence. Like Jagdish Harsana’s earnest 22 year son Brahm Singh, who surprised me with his meticulous record of academic certificates stored neatly in multiple plastic folders – from his school, B Tech and M Tech. A Mangar graduate ! I was glad a stereotype cracked, he is a exception who gives me hope. Brahm Singh is now undergoing a 6 month apprenticeship under a friend in an IT company in NOIDA – he gets Rs. 5,000 a month, and the opportunity to learn a skill under a compassionate mentor (himself from a village) that will surely transform his life and provide him a career. Or like Sattar’s son 19 year old Mustapha, who another kind friend agreed to take on as an apprentice man Friday in his furnishing export company in Gurgaon. Mustapha is 10th Grade pass, but a fine young man who does not drink (that’s a positive in this area, as you can imagine); is sincere, works hard and is handy with getting things done. A Jugar boy. He will make a career here, and move up as he skills himself. Witness the two sample cases – the Gujjar (however surprisingly) has gathered a M Tech and will soon be skilled with real abilities on how to succeed in the organized workplace; while the Muslim boy (not surprisingly) cannot hope to progress beyond what will come his way for loyalty, honesty and hard work. It’s not my case that all Gujjar’s in Faridabad, Haryana are IT ready and all Muslims are unskilled labor; but I would be surprised if this were not the case. I need companies in Gurgaon, Faridabad, Delhi and NOIDA who will select youth like Brahm Singh and Mustapha for on-the-job apprenticeships; where they learn for 6 months and get paid a small stipend during the apprenticeship period, and where they can be absorbed if the company needs those skills – or the young man moves on to other companies and leverages these hard earned skills. As of now, unfortunately, these are only young men as the girls are hidden away to be married by the 12th Grade – if not the 10th. These youth need companies and mentors who will give them hope; and lift them up on their shoulders to look beyond the ‘baba’ and the property sharks, beyond wealth-at-all-costs role models. Companies and mentor individuals who show them a life of values, hard work, diligent application and constant learning. We need to change these young men with hurt and anger in their eyes to a youth who spy a better future. This entry was posted in Uncategorized and tagged Faridabad, Mangar Bani, Mangar Village, village community. Bookmark the permalink. Hi Harsh, we run a Ministry of Textiles backed Skill Development program under the name of ASDA(Apparel Skill Development Academy) at a separate specially set up facility on Khandsa road, Gurgaon. Training will be provided free of cost for the 4-6 week training period and a job in the apparel industry at a starting salary of Rs 7000 plus (CTC- cost to company) guaranteed after completion. Will be happy to include Mangar youth — only problem is they will have to transport themselves. Let me know if this works and I will be happy to initiate next steps. Regards. Poignant and intriguing tale, Harsh. Manger reflects the story of most of Indian villages. The southern villages have even more influence of “so called spiritual baba/ sects/ mutts” and castism violence. The differentiator perhaps is exposure to education among youth and childrens. Very good perspective, Harsh. Great to see the initiative you have taken. More power to your elbow!